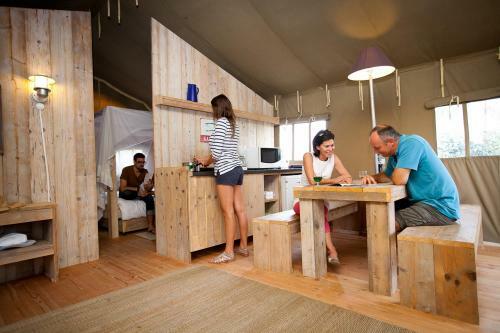 Be chic adventurers in one of our 5 eco lodges! You will be charmed by their natural and neat decoration, with soft and soothing colours and untreated wood to avoid any toxic fumes! Change of scenery and zen attitude guaranteed! 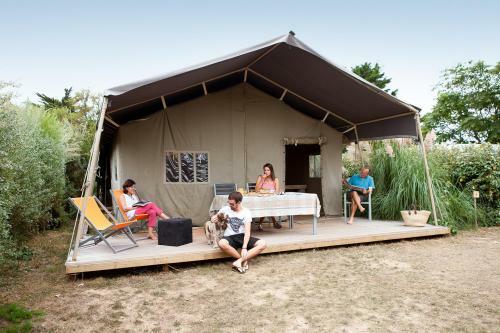 Made of 2 dense canvas (an outside roof of 900 g/m2 and an inside canvas of 600 g/m2) and equipped with inside shutters: your eco lodge is perfectly insulated. They are certified under the ISO 9001 standard. 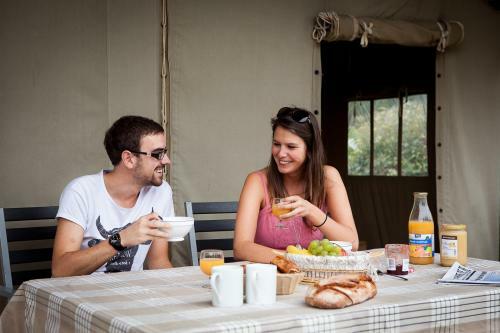 Come with a large family or with friends: our lodges can accommodate up to 7 persons! a worktop, a refrigerator, 1 electric coffee maker, 1 kettle, 1 micro-wave oven and tableware and kitchen ware. Bedding equipment is fully supplied for stays of a minimum of 7 days. A point of cold and drinkable water is available outside. 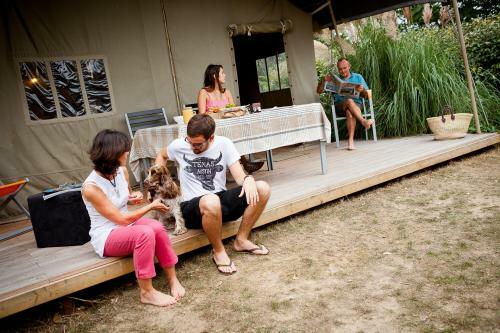 You will have access to the campsite collective sanitary blocks for the shower, the toilets and the washing-up. We remind you that cleaning is not included in the cost of your stay. You have to clean up your rental before departure. An inventory of the fixtures will be carried out at that moment. If the state of cleanliness of your rental is not compliant, all or part of the security deposit will be kept with a minimum of 60,00€.